These red Oak wood vents come stained in a light oak finish for those do-it-yourselves who are in a time crunch. 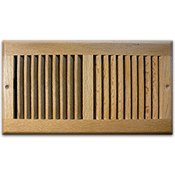 Accord air return grilles are made of solid oak and the faceplate is approximately 1/2” thick. Using wood vents in your home is a great idea for places which are susceptible to moisture such as your bathroom. These air return grilles will not rust and do not have a damper to control the airflow. This is simply a wood vent which will allow air to distribute into your home in both heating and cooling situations. Our air return grilles are intended for use on either your wall or ceiling but not the floor. Offered in two sizes, wood vents by Accord are mounted onto the wall with screws. This air return grilles faceplate has 2 pre drilled screw holes and comes with screws for mounting. 61-0106 10" x 6" Size will vary. 61-0107 12" x 6" Size will vary. Tip: Purchase air return grilles based on the measurement of your hole opening in the wall or ceiling. Do not take a measurement from your existing grille.The 12 x 6 wood vent will fit over a hole opening that measures 12 x 6 inches. To find air return grilles which have a damper to open or close off the airflow, we have matching wooden wall registers. Get your wood vents now and save time and money since they are already stained! Choose Size 61-0106 10" x 6" Light Finish Oak R.A.G. 61-0107 12" x 6" Light Finish Oak R.A.G.